Home › Electronics › Certicable 16Awg Cl2 Rated 2-Conductor Loud Speaker Wire Cable 50 Ft - Can Be..
Certicable 16Awg Cl2 Rated 2-Conductor Loud Speaker Wire Cable 50 Ft - Can Be..
We offer wires that deliver high fidelity, wide frequency range and low signalloss. 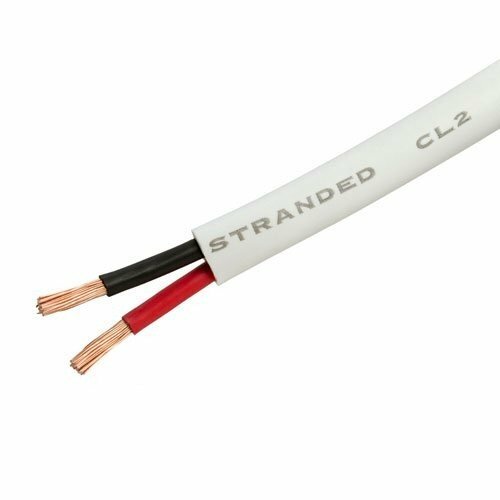 These cables are capable of delivering loud, clear and crisp audioreproduction limited only by the quality of the equipment you are using.Ifyou're looking for a decor friendly cable, look no further than our CL2 ratedspeaker cable. They come with a white outer jacket to blend in with your wallsand baseboards for out of wall applications. Our Speaker Wires are CL2 ratedto meet most building codes for behind the walls installation.CL2 PVCJacketOur CL2 Rated 2-Conductor Loud Speaker Cable comes wrapped in a sturdyPVC (Polyvinyl Chloride) Jacket, built to withstand high levels of stress,pulling, and pushing.CL2 rated speaker wires are made of the heat resistantmaterial which makes them the most safe and permitted option for in-wallinstallations.Strand Cable DesignDesigned for flexible, simple installations,this particular type of speaker cable is perfect for most installations wherecable runs require several bends and twists in the line.